The traditional eating habits of the Mediterranean people are based on the agricultural products of their region, which has a long growing season and a rather mild climate. The traditional diets of the Greeks, French, Italians, Spaniards and Middle Easterners reflect distinct cuisines and culinary practices, but they also have a great deal in common. Certain foods, such as beef and butter, were never very popular in the Mediterranean region because the region did not support the expansive grazing lands required to raise large quantities of buffalo and steer. Most cheeses are made from sheep’s milk and are lower in cholesterol than those made from cow’s milk. The region’s climate is favorable to growing olive trees, so olive oil is abundant and used in cooking instead of butter. With its monounsaturated fat, olive oil is much healthier than butter. The Mediterranean peoples consume fish, poultry, game and lamb rather than beef. The meat of sheep, goats and chickens contains some fat, of course, but Mediterraneans usually consume far less meat than their northern European neighbors. Wine, which has certain health benefits, is a staple of the Mediterranean diet and regions like Italy and southern France have, historically, produced wine and wine is what is served with meals. The Mediterranean Diet is abundant in fruits, vegetables, whole grains, legumes and olive oil and it features fish and poultry—lean sources of protein—over red meat, which contains more saturated fat. 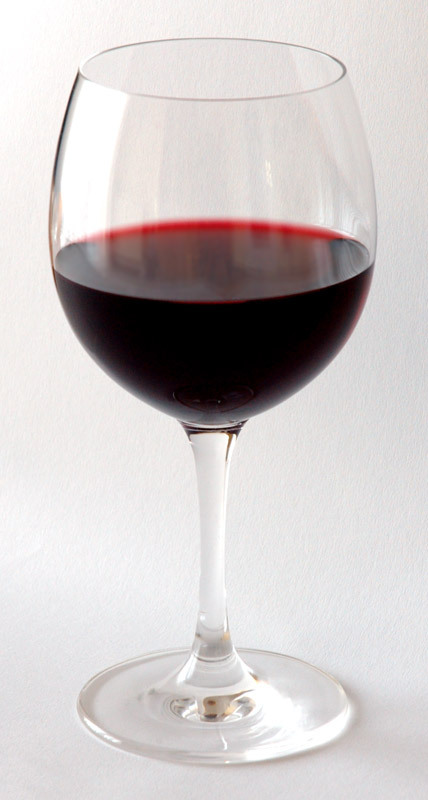 Red wine is consumed regularly but in moderate amounts. Here are a few recipes that can get you started on eating like a Mediterranean. In a large bowl, whisk together lemon zest, 1/4 cup lemon juice, garlic, oregano, olive oil, salt and black pepper. Transfer half of the dressing to a second large bowl. Add tomatoes and eggplant to the first large bowl, tossing to coat. Let stand for 15 minutes. To the second large bowl, add cucumber, bell pepper, olives and onion; toss well with dressing and set aside. Heat grill to medium-high and lightly oil the grate with cooking oil. If it is too cold to grill where you live, a stovetop grill or grill pan can be used. 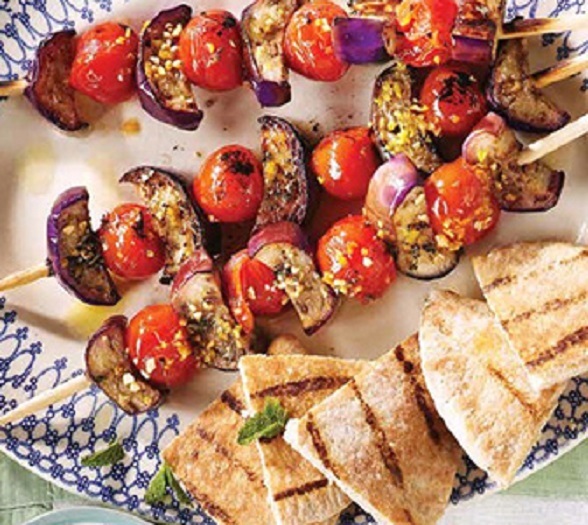 On each skewer, thread tomatoes and eggplant, dividing ingredients evenly among the skewers. Mist skewers with cooking spray. Place skewers on the grill; close lid and cook for 8 to 10 minutes, turning once or twice, until tender. On an indoor grill turn skewers often to cook evenly. Mist pitas with cooking spray and grill, turning once, until lightly toasted and warm, about 1 minute. Cut into quarters and divide among 4 serving plates. Add spinach to the salad and toss. Serve with souvlaki, yogurt sauce and pita bread. In a large Dutch oven, add tomatoes, leeks, fennel, farro, broth, tomato paste and 1 1/2 cups water; stir to break up tomato paste. Cover, bring to boiling, reduce heat to a simmer and cook for 30-40 minutes or until the farro is tender. Remove lid, add shrimp and stir to combine. Replace lid and continue cooking until shrimp are pink and opaque throughout, about 2-3 minutes. Divide among soup bowls and garnish with parsley. Separate leaves from the stems of the Swiss chard. Roughly chop leaves and set aside. Cut stems into 1-inch pieces. In a large skillet or Dutch oven, heat olive oil over medium heat. Add onion, garlic and red pepper, and saute until onion is translucent about 6 minutes. Add Swiss chard stems, olives and the water; cover and cook 3 minutes. 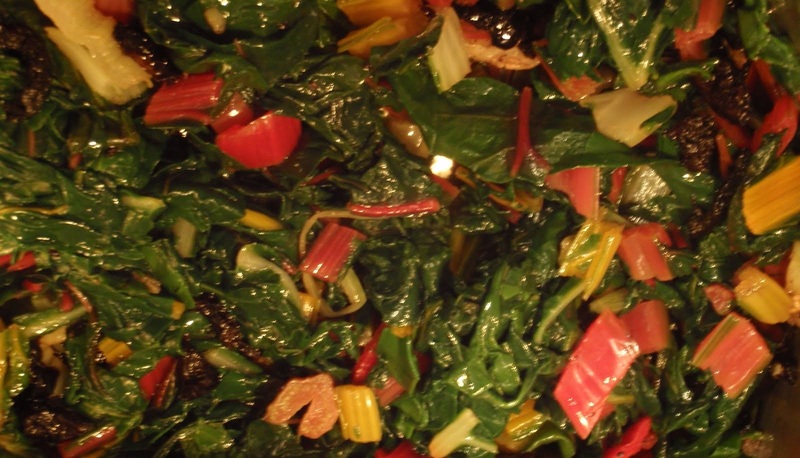 Stir in Swiss chard leaves; cover and continue cooking until stems and leaves are tender, about 4 minutes. Serve immediately. Season chicken with salt and black pepper. In a large skillet with a cover over medium-high, heat 1 tablespoon oil. Add chicken and cook for about 1-2 minutes on each side to quickly brown. Remove chicken pieces to a plate. Reduce skillet heat to medium-low and add the remaining oil and garlic; cook for 1 minute, until lightly browned and fragrant. Add the potatoes and peppers and cook for about 4 minutes, until the potatoes begin to brown. In a small bowl combine the lemon juice, yogurt and arrowroot and whisk until smooth. Stir yogurt mixture into the skillet. Stir in artichokes and dill. Return chicken pieces to the skillet, nestling them on top of the vegetable mixture. Cover the skillet and cook for 30 minutes, until the artichokesand potatoes are tender and the sauce is thickened. 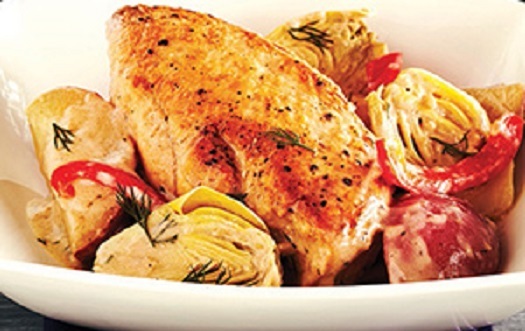 Serve chicken and vegetables with the sauce and garnish with additional dill. Halloumi cheese originated in Cyprus and, subsequently, gained popularity throughout the Middle East region. The cheese is white, with a distinctive layered texture, similar to mozzarella and has a salty flavor. Preheat oven to 450 degrees F. Oil a pizza pan. Place tomatoes, garlic and 1 tablespoon oil in a food processor; season with salt and pepper. Pulse 3 to 4 times until ingredients are incorporated but chunky. Place the dough in the pizza pan. Using your hands stretch the dough until it covers the surface of the pan. Spread tomato sauce evenly over the dough, leaving a 1-inch border all around. Top with cheese and pine nuts; season with salt and pepper. Bake until the crust is golden, 15 to 20 minutes. Toss arugula with vinegar and 1 tablespoon oil; season with salt and pepper. 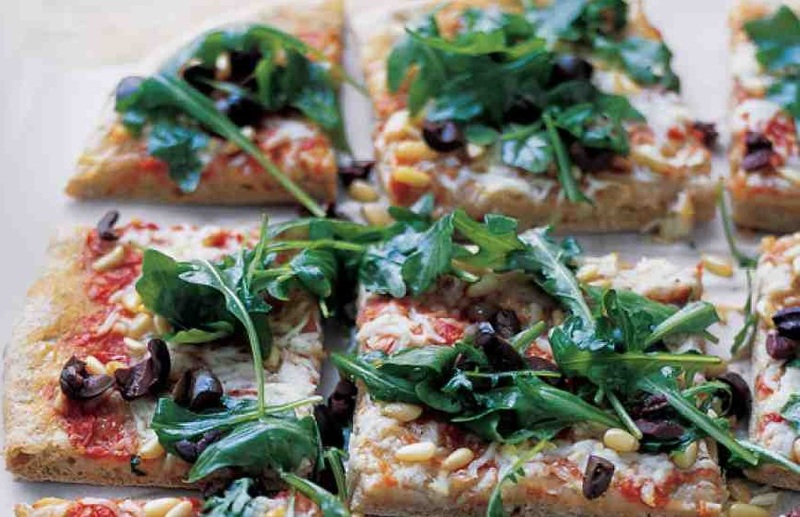 Sprinkle arugula and olives over baked pizza. Cut into serving pieces. In the bowl with the yeast, whisk in the sugar, oil and salt. Stir in flours with a wooden spoon until a sticky dough forms. Transfer to the oiled bowl; brush top of dough with oil. Cover the bowl with plastic wrap; let stand in a warm spot until dough has doubled in size, about 1 hour. Use one ball of dough for the pizza above and freeze the second dough for another time. Eating like a Mediterranean ? Key ingredients of the Mediterranean cuisine include olive oil, fresh fruits, vegetables, protein-rich legumes, fish and whole grains with moderate amounts of wine and red meat. The flavors are rich and the health benefits for people choosing a Mediterranean diet — one of the world’s healthiest — are hard to ignore. These people are less likely to develop high blood pressure, high cholesterol or become obese. Numerous research studies suggest that the benefits of following a Mediterranean-style eating pattern may be many: improved weight loss, better control of blood glucose (sugar) levels and reduced risk of depression, to name a few. Eating like a Mediterranean has also been associated with reduced levels of inflammation, a risk factor for heart attack, stroke and Alzheimer’s disease. If you’re trying to eat foods that are better for your heart, start with the principles of Mediterranean cooking. Stock your pantry and cook at home. Make sure your pantry and freezer are stocked with Mediterranean-inspired staples like canned tomatoes, olives, whole-wheat pasta and frozen vegetables. Love Italian food, then a bowl of pasta for dinner is a no-brainer. Typical standbys are Penne with Vodka Sauce or Pasta with Broccoli Rabe. Experiment with “real” whole grains that are still in their “whole” form and haven’t been refined. Quinoa, a grain that was a staple in the ancient Incas’ diet, cooks up in just 20 minutes, making it a great side dish for weeknight meals. Barley is full of fiber and it’s filling. Pair it with mushrooms for a steamy, satisfying soup. A hot bowl of oatmeal with some fresh summer berries is perfect for breakfast. Even popcorn is a whole grain—just keep it healthy by eating air-popped corn and forgo the butter (try a drizzle of olive oil instead). Supplement your intake with other whole-grain products, like whole-wheat bread and pasta. Look for the term “whole” or “whole grain” on the food package and in the ingredient list—it should be listed as the first ingredient. But if you still find it too hard to make the switch from your old refined favorites, phase in a whole grain by using whole-grain blends of pastas and rice or mixing whole grains half-and-half with a refined one (like half whole-wheat pasta and half white). By displacing meat at some meals, you can lower your saturated-fat intake while adding healthful nutrients, like fiber and antioxidant-rich flavonoids. If you eat meat every day right now, try making a vegetarian dinner, like Multi-Bean Chili, once a week. Swap out most of your red meat and replace it with skinless chicken and turkey, fish, beans, nuts and other plants. Start by making a few small changes. Aim to eat fish of any kind—except for fried, of course—twice a week. Fatty fish, such as salmon or tuna are especially good choices: they are rich in omega-3s, a type of polyunsaturated fat, linked with improved heart health. Make the focus of the meal whole grains and vegetables and think of meat as a flavoring; for example, use a little diced pancetta in a tomato sauce for pasta. If you do have a hankering for a steak, it’s OK to indulge, just do so occasionally and choose a lean cut, like top loin, sirloin, flank steak or strip steak and limit your portion size to 4 ounces. Use heart-healthy olive oil as well as other plant-based oils like canola and walnut oil instead of saturated-fat-laden butter, lard or shortening—even in baking. There are many dessert recipes now that use olive oil instead of butter. Olive oil is a good source of heart-healthy monounsaturated fats. A high-quality extra-virgin olive oil seasoned with balsamic vinegar is delicious for dipping bread and is a healthier alternative to butter. Other plant-based oils, such as canola or walnut oil, are also rich in heart-healthy monounsaturated and beneficial omega-3 fatty acids. Aim for 4 to 8 servings of vegetables a day. A serving size is 1/2 to 2 cups depending on the vegetable. Pick vegetables in a variety of colors to get a range of antioxidants and vitamins. Start your day out with a spinach and Cheddar omelet, have a bowl of vegetable soup for lunch and have roasted carrots and a green salad for dinner. Big green salads are a great way to include several vegetable servings at once. Generally a good source of fiber, vitamin C and antioxidants, fresh fruit is a healthy way to indulge your sweet tooth. If it helps you to eat more, drizzle slices of pear with honey or sprinkle a little brown sugar on grapefruit. Keep fresh fruit visible at home and keep a piece or two at work so you have a healthful snack when your stomach starts growling. Lots of grocery stores stock exotic fruit—pick a new one to try each week and expand your fruit horizons. Research indicates that people who drink moderately are less likely to have heart disease than those who abstain. Alcohol appears to raise “good” HDL cholesterol. Wine, in particular, “thins” the blood (making it less prone to clotting) and also contains antioxidants that prevent your arteries from taking up LDL cholesterol, a process that can lead to plaque buildup. Remember, “1 drink” equals 12 ounces of beer, 5 ounces of wine or 1 1/2 ounces of liquor. Eating like a Mediterranean is as much lifestyle as it is diet. Instead of gobbling your meal in front of the TV, slow down and sit down at the table with your family and friends to savor what you’re eating. Not only will you enjoy your company and your food, eating slowly allows you to tune in to your body’s hunger and fullness signals. You’re more apt to eat just until you’re satisfied then until you’re busting-at-the-seams full. This is the perfect time of year to make some changes to your diet. Fresh fruits and vegetables are plentiful and local fresh caught fish is more available. These delicious dinners can all be enjoyed during a leisurely, relaxing dinner on the patio on a warm summer evening. Bring a medium pot of well-salted water to a boil. Cook the pasta until just barely al dente, about 1 minute less than package timing. Reserve 1 cup of the cooking water and drain the pasta. While the pasta cooks, put the pancetta in a cold 10-inch skillet and set over medium-high heat. When the pancetta starts sizzling, add the garlic and cook, stirring constantly, until starting to brown, 1 minute. Reduce the heat to medium and continue to cook the pancetta until golden, an additional 2 to 3 minutes. If the pancetta has rendered a lot of its fat, spoon off all but 1 tablespoon of the fat from the pan. Add the beans to the pan and cook, stirring constantly, until they’re crisp-tender, 3 to 4 minutes. Remove the garlic and season the beans with salt and pepper. With the pan still over medium heat, add the pasta, 1/2 cup of the pasta water and the olive oil. Toss to combine. Add another 1/4 cup pasta water and 3/4 cup of the Parmigiano. Stir well and season to taste with salt and pepper. If necessary, add a little more pasta water to loosen the sauce. Transfer the pasta to a serving bowl. Grind black pepper over the top and sprinkle with the remaining cheese. Place broiler pan as close to heating element as possible and heat 5 minutes. On a plate, coat fillets on both sides with 1 tablespoons oil. Carefully remove pan from broiler and place on the stovetop. Arrange fillets on pan, skin side down; sprinkle with 1/4 teaspoon salt and 1/4 teaspoon pepper. Broil fish 6 minutes. In a bowl, mix together lemon slices, juice, oregano, capers, olives, remaining 2 tablespoons oil and remaining 3/4 teaspoons salt and 1/4 teaspoons pepper. To prepare chicken: place chicken, olive oil, vinegar, salt and pepper in a zip-top plastic bag; place in refrigerator and marinate 2 to 24 hours. To grill the peppers: preheat grill. Place peppers on the grill and cook, turning until charred all over. Place peppers in a paper or plastic bag to let steam for 10 minutes. Peel and seed peppers. To prepare sauce: place grilled peppers, oil, vinegar, salt and pepper in a food processor or blender; puree until smooth. Preheat grill to medium and oil grill grates. Remove chicken from marinade; discard marinade. Grill chicken 7 minutes, turn, place feta cheese slices on top of the chicken and cook 7 more minutes or until cooked through. Serve with flatbread or pita. Wash and dry the romaine and arugula. Toss in a large bowl with the olives, onion and oranges. Add freshly ground black pepper to taste (the olives may be salty, so don’t add any salt at this point). Whisk the dressing ingredients, seasoning it to taste. Slowly pour some of the dressing over the salad while tossing well to coat all. Be careful not to use too much dressing for the amount of greens. Garnish with very thin slices of orange and orange zest. 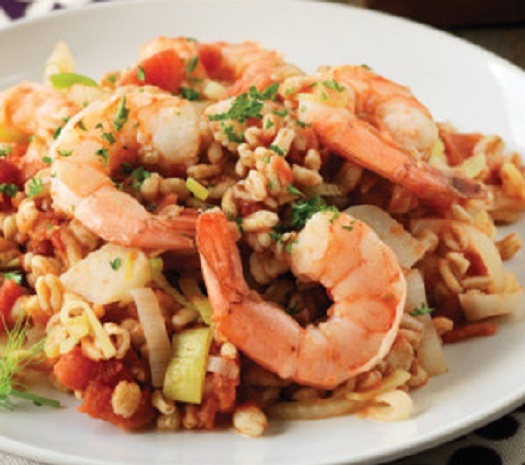 In a large bowl, combine the diced tomatoes with the shredded basil, scallions, olive oil and crushed red pepper. Season lightly with salt and black pepper and let the tomatoes stand for 20 minutes. Meanwhile, in a mini food processor, pulse the almonds with the anchovies and garlic until finely chopped. Add the 1/2 cup of pecorino cheese and the capers and pulse to combine. In a large pot of boiling salted water, cook the pasta until al dente. Reserve a little pasta water in case the sauce needs thinning. Drain pasta and add the pasta to the tomatoes along with the chopped almond mixture and toss well. Serve the pasta, passing extra cheese at the table. Bring 2 cups of water to boil, adding the rice and turmeric. Return to a boil, cover and simmer for 25 minutes. Cook the lentils in 3 cups of boiling water until soft. Saute the onion, pepper and garlic in olive oil in a skillet. Mix the cooking sauce ingredients together in a bowl. For the filling: in a large bowl, combine the sauteed vegetables, rice, lentils, almonds and raisins. Fill each cabbage leaf with about 1/2 to 3/4 cup filling, beginning at the thick end of the leaf. Fold this end over the filling, folding the edges in as you go to make a neat roll. Place the rolls in one or two casseroles, covering with the sauce. Bake the cabbage rolls covered at 350 degrees F, 45-60 minutes until cabbage is tender. Cool slightly and serve from the dish they were baked in.